The electricity moving through a wire or other conductor consists of its voltage (V), current (I) and resistance (R). 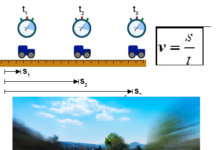 Voltage is potential energy, current is the amount of electrons flowing through the wire, and resistance is the friction force on the electron flow. 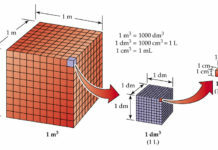 Device that resists the flow of charges. Used to control current and voltage. 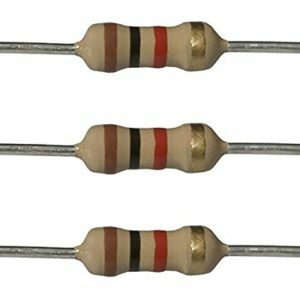 Many kinds of resistors: Fixed and variable. 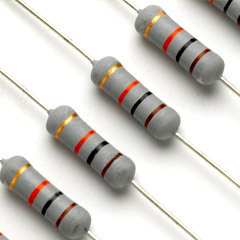 Fixed resistors have the same resistance for a wide range of temperatures, and electrical currents. Color code scheme allows us to figure out how much resistance it provides. 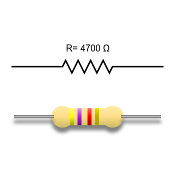 Resistors represents a given amount of resistance in a circuit. Resistance is a measure of how the flow of electric current is opposed or “resisted.”The value of fixed resistors cannot be changed. We can present resistors and other electrical devices with symbols. 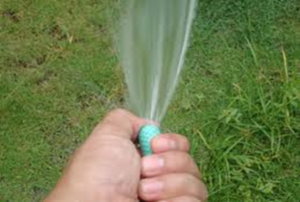 A conductor like a piece of metal has its atoms so arranged that electrons can readily pass around the atoms with little friction or resistance.This resistance is similar to the friction of the hose against the water moving through it. 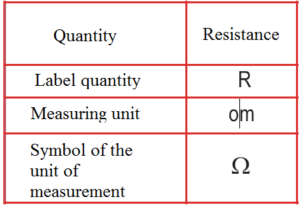 Ohm is the unit of measurement of the electrical resistance. In a nonconductor or poor conductor, the atoms are so arranged as to greatly resist or impede the travel of the electrons. 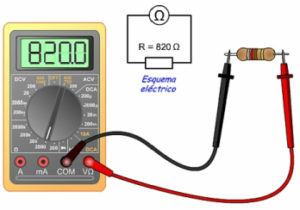 Example: In the figure below, the bulb is illuminated brightly if the resistor is not connected to the wheel. Bulb lowlights when a 4Ω resistor is connected and even weaker when a 6Ω resistor is connected. The instrument for measuring the optic is called the ommeter. 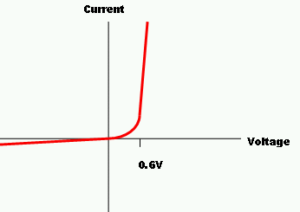 What is the relationship between current, voltage and resistance? Method 1: We use a circuit where we change the battery value and note the value current of each battery value. Method 2: We use a fixed voltage battery using variable resistance and changing of resistance we take current and voltage rating each time. 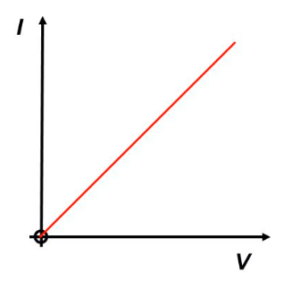 The graph is a straight line through the origin.The wire or resistor obeys Ohm’s law which states that that the current is proportional to the voltage. 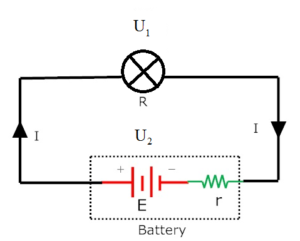 Example2: Repeat the experiment five times by changing current in the circuit with the help of rheostat. Note the readings in the table. From the above table it is observed that the ratio is always constant. 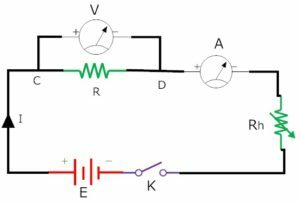 Hence ohm’s law is verified. i.e. 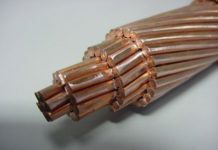 The resistance of a conductor remains constant at constant temperature no matter what applied voltage is used to measure it. Georg Ohm • Georg Simon Ohm (16 March 1789 – 6 July 1854) was a German physicist and mathematician. 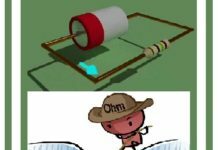 As a school teacher, Ohm began his research with the new electrochemical cell, invented by Italian scientist Alessandro Volta. 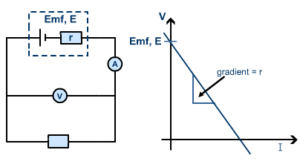 Using equipment of his own creation, Ohm found that there is a direct proportionality between the potential difference (voltage) applied across a conductor and the resultant electric current. This relationship is known as Ohm’s law. where I is the current in amperes, U the voltage in volts and R the resistance in ohms. To illustrate: a resistor of one ohm subjected to a current of 1A has a voltage difference of 1V across its terminals. The equation is named after Georg Ohm. 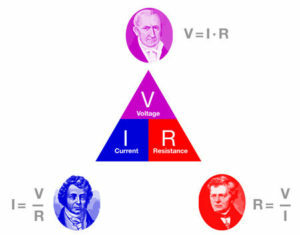 Ohm’s Law expresses the relationshipbetween the current (I), the voltage (E),and the resistance (R) in a circuit.Ohm’s Law can be expressed in threedifferent ways, and can be applied tothe entire circuit or to any part of acircuit. 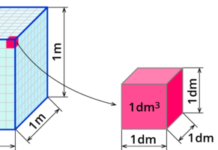 When any two factors areknown, the third unknown factor can becalculated from Ohm’s Law. By knowing any two values of the Voltage, Current or Resistance quantities we can use Ohms Law to find the third missing value. 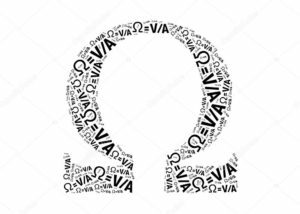 Ohms Law is used extensively in electronics formulas and calculations so it is “very important to understand and accurately remember these formulas”. 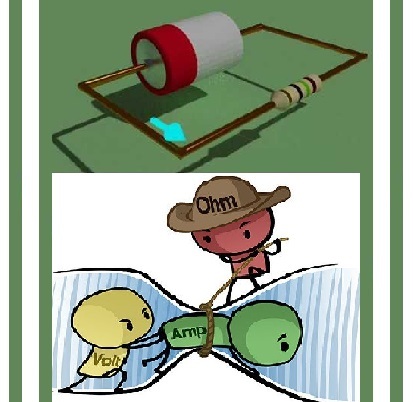 It is sometimes easier to remember this Ohms law relationship by using pictures. 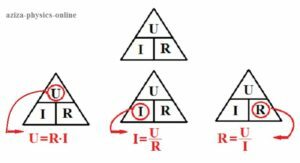 Here the three quantities of U, I and R have been superimposed into a triangle (affectionately called the Ohms Law Triangle) giving voltage at the top with current and resistance below. 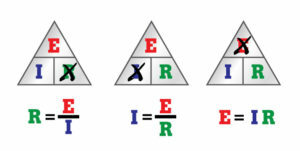 This arrangement represents the actual position of each quantity within the Ohms law formulas. 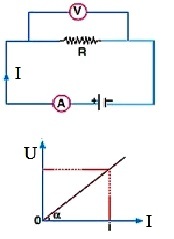 Then by using Ohms Law we can see that a voltage of 1V applied to a resistor of 1Ω will cause a current of 1A to flow and the greater the resistance value, the less current that will flow for a given applied voltage. .
Any Electrical device or component that obeys “Ohms Law” that is, the current flowing through it is proportional to the voltage across it ( I α V ), such as resistors or cables, are said to be “Ohmic” in nature, and devices that do not, such as transistors or diodes, are said to be “Non-ohmic” devices. 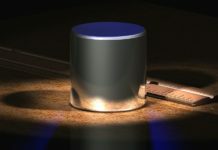 Om’s law applies only to metallic conductors. Om’s law does not apply to the human body and diode. A short circuit happens when electric current can flow round a circuit from one terminal of the battery to the other without passing through any components. In a short circuit, the wire heats up and battery will go flat. In any circuit there are components that put energy in to the circuit and components that take energy out. 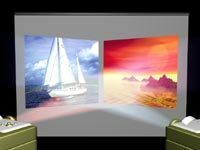 From now on, we will say that any device putting energy into a circuit is providing an electo-motive force (emf) and any device taking it out has a potential difference DV across it. Cells and batteries are not perfect (what is – apart from the moment your last exam finishes, of course?). Use them for a while and you will notice they get hot. 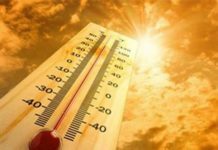 Where is the heat energy coming from? It’s from the current moving through the inside of the cell. The resistance inside the cell turns some of the electrical energy it produced to heat energy as the electrons move through it. 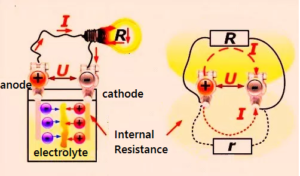 You need to consider the internal resistance when deciding if a cell is appropriate to use in a particular circuit. For the greatest efficiency the external resistance must be much greater than the internal resistance of the cell. 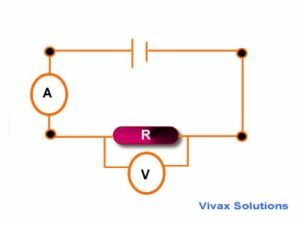 Power supplies which deliver low voltages and higher currents, like a car battery, need to have a low internal resistance, as shown above. High-voltage power supplies that produce thousands of volts must have an extremely high internal resistance to limit the current that would flow if there was an accidental short-circuit. The circuit which carries same current on every branch called simple circuit. 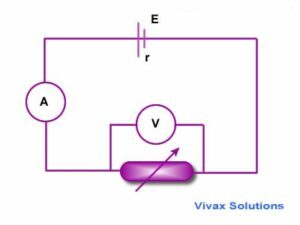 A simple circuit is shown in figure. It is called lost voltage of battery. Because internal resistance of battery drops it. Battery and the bulb are carrying same current I. 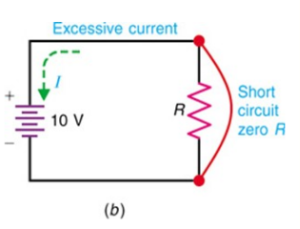 It can be said that current of a circuit is proportional its electromotive force of the circuit and inversely proportional to the resistance of the circuit. 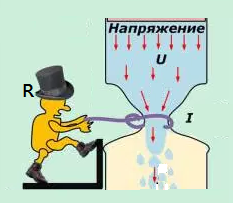 Increase of electromotive force increases current, decrease of resistance increases current flow and increase of resistance decreases current.